The air is full of tiny liquid and solid particles, collectively known as aerosols. They're created by dust storms, volcanic eruptions, human activity, and even the natural passing of the seasons. 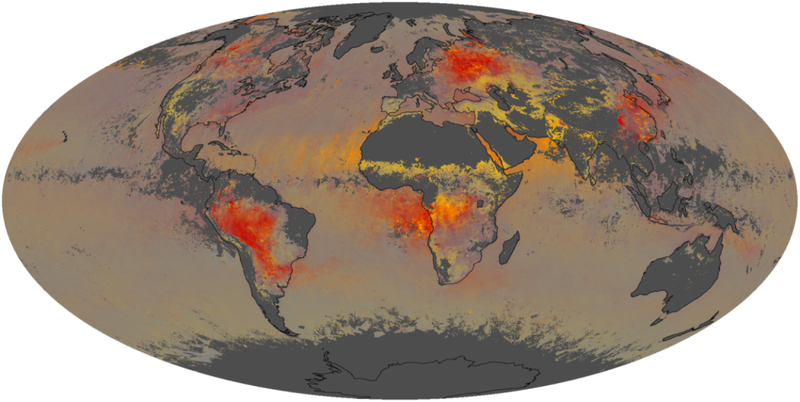 This amazing map reveals where the aerosols are. This map shows the global distribution of aerosols in August 2010, and the proportion of those aerosols that are large or small. Yellow areas are predominantly coarse particles, like dust and sea salt, while red areas are mainly fine aerosols from smoke or pollution. Gray indicates areas with no data. The brighter or more intense the color, the higher the concentration of aerosols. Yellow bands-larger, coarse particles-around the Middle East, North Africa, and western North America likely indicate dust and sand storms as the northern hemisphere reaches the driest time of year. The bright red areas in Russia and much of South America reveal the intense wildfires and some agricultural burning, which coincided with hot summers and drought in several regions. The red patches in western Canada spring from summer wildfires, while China was likely coping with a combination of fire, dust, and pollution events. It is unclear what was happening in western Africa. You can click on the map up top for an even closer look.